This eight year old German Shepherd Dog has been acquired from a rescue centre but is brought to you because of this depigmentation of the nictitating membrane. What is the condition and is it a problem for the animal? What treatment might you recommend? 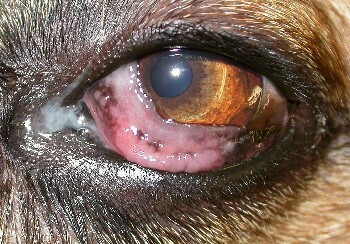 This is classic lymphocytic plasmacytic conjuctivitis commonly seen in this breed of dog. It causes no irritation and no visual disturbance unless the dog has concurrent chronic superficial keratitis. Nevertheless its appearance concerns owners and thus treatment with topical steroid (dexamethasone alcohol in Maxidex or prednisolone acetate in Pred Forte) or topical cyclosporine (Optimmune) can be useful. 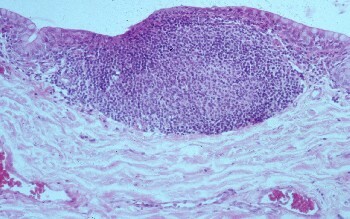 The nodules seen in the conjunctiva are lymphoid follicles, as demonstrated in this histopathological section. This entry was posted in Cases and tagged dog, Plasmacytic lymphocytic conjunctivitis. Bookmark the permalink.